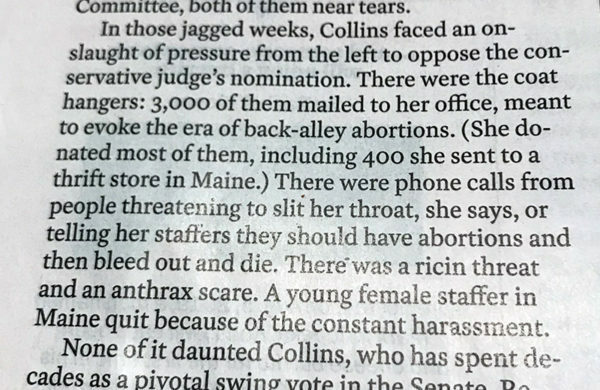 This is from a recent TIME magazine issue, in an article about how Maine Senator Susan Collins (R) is one of the last moderates left in the Senate. The “jagged weeks” mentioned is a description of the time immediately after she voted to confirm Brett Kavanagh to the Supreme Court. Ask yourself: if this was a Democratic Senator and these things were being done by right-wing nutjobs, would the author have passed them off as “an onslaught of pressure” and “harassment”? I love journalism. I hate the way our current president (and his predecessor) attacks journalists. I think the work that our press does is utterly critical to a strong democracy. But I also hate how so many of them let their personal biases slip into their work.